You know, that was a nice weekend. It really was. I would do it all over again next weekend if I could. (Or maybe next month or so – gimme a chance to do laundry and expand the travel budget first, and catch up on sleep). It is always the case that I feel this way after a knitting weekend of any kind, and I am often left pondering the exact reasons why. Part of it is quite simply the getaway factor – a weekend away as a tourist in another city for any reason is cause enough for relaxation and rejuvenation. People need breaks. Knitters need knitting time. Learning from knitters is pretty great. Everyone has a different style, everyone wants you to walk away as a better or more confident knitter than when you came in, everyone is as passionate about knitting as you could hope them to be. To me it always feels like I leave with a better sense of how my current knowledge fits in, in context to the wider realm of Knitting that is out there. This weekend I learned a new way of holding my yarns when knittng colour-work, a toe-up gusset and heel, and a scadload of tips that were either unfamiliar or gave a name to something that was familiar to me but previously un-named, and that is awesome. I do love that this weekend’s event was held in New York City. I have enjoyed visiting it in the past and I enjoyed visiting it again. I’m sure there were conveniences and inconveniences of this location for Vogue Knitting, but I do love that all of these classes were being held just steps (STEPS) away from Broadway, the Museum of Modern Art, Central Park, the Guggenheim, and so many other places of creativity and expression and design that New York City is known for. Yesterday was my last day (though my room-mate Lisa continued on with 2 more classes yesterday and another overnight in the hotel, lucky duck), and it happened that I didn’t fly out until late afternoon, so I had an entire free morning, and so I took myself on up to the Metropolitan Museum of Art. May I say, if you should ever find yourself with a free Sunday morning in New York City, you could do a hell of a lot worse than hanging out at the Met. 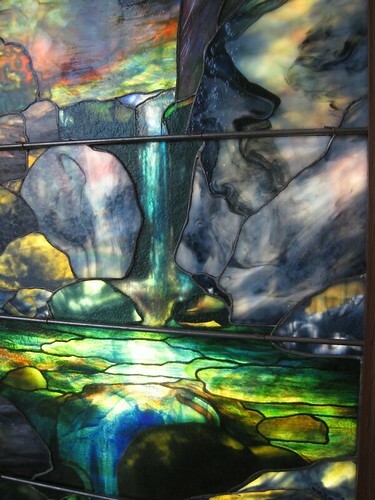 I walked up through Central Park (wistfully observing the joggers), was just about the third person in the door after it opened, and was all but alone with the Tiffany glass in the American Wing before the steady flow of the day’s tourists began to come in. And my 2 days’ worth of knitting workshops were still rolling around in my head as I strolled past the exhibits and it was great. It got me thinking about that never-solved question about whether knitting sits within the realm of craft or art, with the bonus of learning a bit of Greek and Roman history through sculpture. Later on in the afternoon when I was waiting in Newark Airport to board my plane, I messaged my friend Liz (to check in on her Buffy the Vampire Slayer viewing, since she’s just now hitting Season 6 and well, Things Happen in that season that a person sometimes needs to talk out, you know how that is), and reported that I did classes with Meg Swansen, Jared Flood, Anne Hanson, and Cookie A, and got to visit the MoMA and the Met again on top of it all, and she messaged back to say “Oh fun! 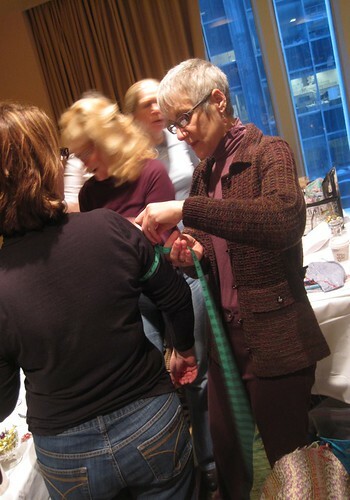 Behold the healing powers of crowds of knitters! Plus art!” And you know, that really does sum it all up. Because really, screw the either-or scenario. Knitting is both art and craft and we know it. I think this must be where the whole idea of ‘design’ fits in – combining form and function without sacrificing either one. A lampshade is a lampshade and it takes craftsmanship to make it function well, but in the form of a piece from the Tiffany glass studio, it is also art. It is most beautiful to look at when the lamp itself is lit up, being used for its functional purpose. In the best possible scenario, this is what knitters are doing. When you wear a sweater that you have made to fit you well, as a result of a series of creative decisions on the part of the designer combined with your decisions as the knitter executing it to fit your own body, you are making something that is going to keep you warm at the same time as being pleasing to look at, and that is a fantastic thing. There are really a very limited number of practical reasons why we need eleventy-million different ways of working an increase or constructing a sock. But we DO have eleventy-million different ways of doing these things, because we are constantly applying our skills in new and exciting ways that will not sacrifice our pleasure to do so. We name things as artistic when we want to draw attention to them as things we want to look at and admire over and over again, because when we looked at them the first time, they made us respond in some way that was thoughtful or emotional or satisfying. And I don’t know about you, but I don’t cast on for a sweater or shawl without knowing that I want to look at it over and over again. I suppose this is what makes knitting seem both intimidating and encouraging at the same time. All I want to do now, of course, is knit a sweater. It’s rough returning to the regular routine this week, but at the same time it makes it all the more of a relief to have knitting to return to at the end of the day. 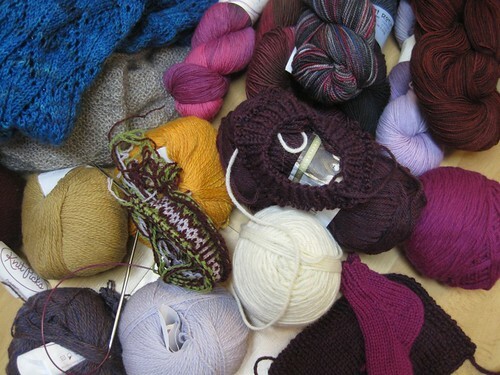 Can’t wait for the next knitting weekend on the horizon. Happy Monday, stay warm and keep the knitting close by! Sounds fascinating! One day I WILL visit NY! Happy knitting, and have a lovely week. 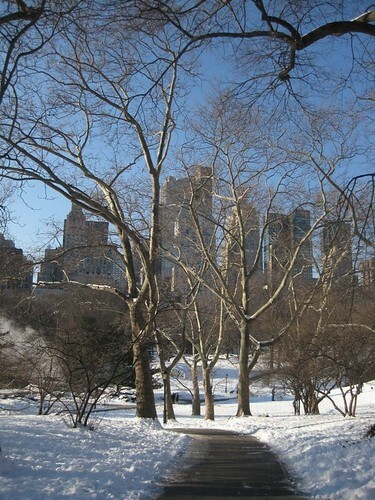 So lovely….I miss New York! What a great post. I *adore* the Met. And am very jealous of the knitting extravaganza. And, as it happens, I just finished season 6 of Buffy last night! 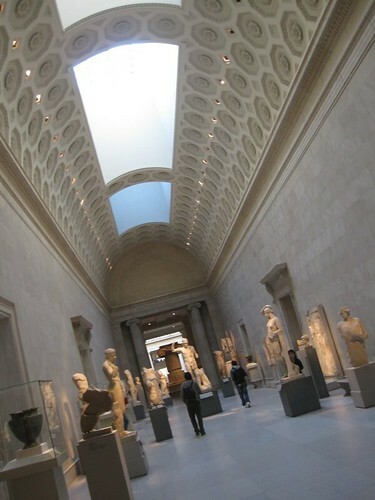 I visit the MET once a season… it’s my favorite Museum in all the world…. Thank you for the update! I had a chance to go for one day, but had a previous commitment to visit my dad (85 years old, so I didn’t want to disappoint – especially when the winter weather was actually cooperating!) Hopefully next time! Would you be able identify the yarns in your first picture and the session with someone measuring an arm??? Still jealous as heck. But in a warm fuzzy kntiterly way. A. I am full of jealousy that I did not get to go to either VKL or NY. So boo. But good for you. I read this sentence, chuckled, then read it aloud to my boyfriend (who I watched Buffy with the first time I saw it), who said in that knowledgeable, slightly forceful way, “Um, Yeah.” Cause we totally get what you mean about needing to talk that season out. I completely agree that knitting can be both art and craft. Beauty that is functional thrills me! I SO wish I could have gone too! I visit NYC 3 or 4 times a year because my daughter lives up there and I just love it all. 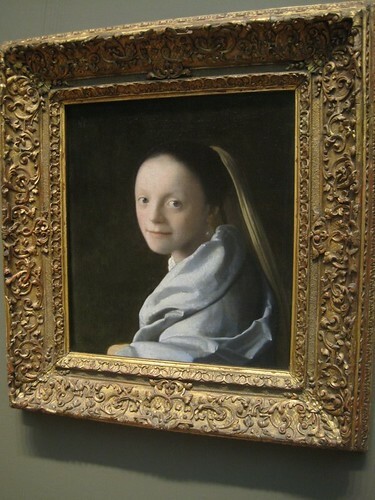 I rotate through the museums, and it’s time to visit the Met again on my next trip. You could never see it all I think. Love your post about knitting; great truths in it. I LOVE being a knitter!! What a wonderful weekend! Glad you got out to the non-knitting world, too. It all intertwines, and inspires. Well said. I’ve got one Fiddlehead mitten blocking right now and the second waiting for the lining tomorrow. Art for sure. Knitting has been my passion and will always be. It’s nice that every once in while we go out and explore the world and the cities around us to take time and relax. Good to know that you had enjoyed being a tourist. :) Good luck with your sweater. Love to look at it when it will be finished. I love to learn a new skill with every project. The museum pictures are beautiful. I hope I get so see it someday.